Berliner Weisse is a light, refreshing sour wheat beer originally brewed by just a handful of breweries around Berlin. I recently had a chance to interview Michael Dawson for Podcast 108, and he provided some great tips on rapidly brewing a Berliner Weisse that could also be applicable to other sour beer styles. Most sources trace the history of Berliner Weisse to a 16th Century Hamburg brewer named Cord Broihan (ref: Wikipedia). He brewed a popular beer called Halberstädter Broihan, that was then picked up by another brewery in Berlin around 1640. Another possibility is that the beer was derived from Flanders Red and Brown ales brought in by migrating Huguenots. While wildly popular in the 18th century, the style is rarely brewed in Berlin anymore – with only two surviving native brands: Berliner Kindl and Schultheiss. However craft breweries in the US and around the world have started producing the style with its distinctive light, refreshing sourness. Berliner Weisse is a very light, low 3% alcohol wheat beer with little to no hop flavor and a distinctive sour finish, usually from lactobacillus. It is often served with syrups with raspberry or woodruff flavoring. It generally has a clean lactic sourness without any Brett “funk” and is served highly carbonated. The beer may be clear or slightly cloudy but very pale in color. The BJCP style guide defines Berliner as having a OG of 1.028-1.032 and very light color of 2-3 SRM. It is a low alcohol beer (2.8-3.8% ABV) and also has little to no bitterness within a range of 3-8 IBUs. The grain bill for a Berliner is from 25-50% wheat malt with the balance being Pilsner malt. Noble hops are typically used though the hop rate is extremely low and hop flavor is not an important feature of the beer. Lactobacillus is used to provide a sour flavor along with conventional continental ale yeast. A moderate water profile is used as water is not a major flavor factor. As mentioned in my interview with Michael Dawson, you can save some time when brewing a Berliner. 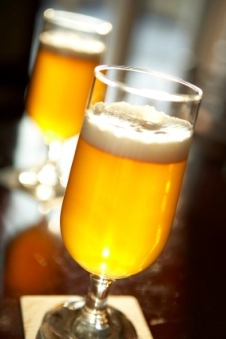 Typically brewing a sour beer is a long process – taking months or even a year or more to complete. However, using the process below you can enjoy your Berliner in just two months. You can mash your Berliner using a simple single infusion mash, as you will get plenty of body from the wheat even though this is a low OG beer. Sparge (or use BIAB) as you normally would. Boil the wort for a normal 60-90 minutes, but don’t add any hops to the wort. Hops will actually inhibit the bacteria we’ll use to sour our beer, so we’ll ad the hops later in the fermentation instead. Some sources recommend lowering the wort pH to 4.5 using lactic acid, phosphoric acid or acid malt at this point. The lower pH will reduce the chance of infection from other wild bacteria and yeasts. Cool the wort and start the fermentation with Lactobacillus only. We’re going to do a two stage fermentation – with the bacteria souring the beer first and then later we’ll use conventional yeast to ferment it. Don’t aerate your wort, and also add a layer of CO2 to the top of your fermenter if you have access to a CO2 tank. Let the beer ferment on Lactobacillus only for a few days, but keep it warm – in the 112-115 F (44-46 C) range. Wrapping the fermenter in an electric blanket is one easy way to do this. If you have access to a pH meter you can monitor the pH of the beer every 12 hours or so. When it reaches 3.6-3.8 you will have the correct sour level for a Berliner. Try not to go below a pH of 3.4 or you may have trouble with the main fermentation. Next boil the wort and add a small amount of hops. This will kill off the Lacto to prevent further souring and also hop your beer. Aerate the beer (oxygen won’t hurt at this point) and add your normal fermentation yeast. Allow the beer to ferment out and bottle or keg as you normally would when it reaches a stable FG value. A traditional approach would be to add the Lacto after fermentation is complete, but the method outlined above is much faster as the Lacto will work much faster in a pristine wort than it will on a beer that has been already fermented. I hope you enjoy brewing your Berliner and also are able to apply the method outlined above for brewing other sour beers. Thanks for joining me on the BeerSmith Home Brewing Blog. You can grab a trial version of BeerSmith from BeerSmith.com. Be sure to sign up for my newsletter or my podcast (also on itunes…and youtube…and streaming radio station) for more great tips on homebrewing. I would love to give a quick Berliner Weisse a go but I don’t think I could keep the beer at 112-115 F (44-46 C). How would it work if the initial Lacto fermentation was a lower temp. Are we talking a much slower start? I have never heard of this style of beer before. Thanks for the introduction and the recipes. I will have to try some out. I used an ol BYO article (Dec 2005) and I believe Brewing Classic Styles to formulate a recipe that suited my system and home. The process was longer for me and I did a pre-ferment with the lacto brevis (I think) before pitching a clean ale yeast, however it turned out amazing. The one thing I would stress that if you are going to bottle this, get yourself some heavy bottles that can handle the increased carbonation. I pushed mine into the 4-4.2 vol range and it’s perfect. My wife loves the champagne-like feel and taste to it! Question about the boils. If you’re not extracting any hop oils and you don’t need to concentrate the wort couldn’t you just do a 15 min boil? And how long is the second boil, 15 min to kill the lacto or full 60 min again? I’m from Brazil and due to obvious reasons, heat blanckets are not easy to find around here. However, it’s summer and the temperature is getting pretty high, with makes me think that maybe I don’t even need a heat blancket. Do you think I can have a reasonable lacto fermentation with something like 34°C of average? During the day it gets near 40°C and during night +/- 28ºC. Quick question about lowering the pH using lactic acid. If I am brewing a regular 5 gal batch and end up with an ideal mash pH, about how much lactic acid will I need to add to drop the pH down to 4.5? The lactic acid I can buy has a concentration of 88%. Of course I will test as I go, but I would like to get an idea of what to expect before I start. (and so I know how much to buy).